I have been working on state estimation in hybrid discrete-continuous systems. I applied recent techniques to two robotic applications; a cooperative construction scenario on the MIT MERS robotics testbed, and a contact and force detection problem on the NASA JPL LEMUR testbed. The JPL work is described here. My research in this area has developed methods for active hybrid estimation. The key idea behind active estimation is that much more information can be obtained by actively probing a system, rather than making observations passively. In the case of a UAV actuator fault, detection of the fault is impossible without requesting control effort from the actuator. I have developed novel methods for active diagnosis, whereby a controller can ensure that the nominal plan is successful, while optimally detecting faults. This work is described here. An additional publication on advances in hybrid estimation is here. "Active Estimation for Jump Markov Linear Systems." L. Blackmore, S. Rajamanoharan and B. C. Williams. IEEE Transactions on Automatic Control, Nov 2008, Volume 53, Issue 10, pages 2223-2236.
" A Combined Stochastic and Greedy Hybrid Estimation Capability for Concurrent Hybrid Models with Autonomous Mode Transitions." L. Blackmore, S. Funiak and B. C. Williams. Journal of Robotics and Autonomous Systems 56 (2008) 105-129. A persistent link to this article is here. 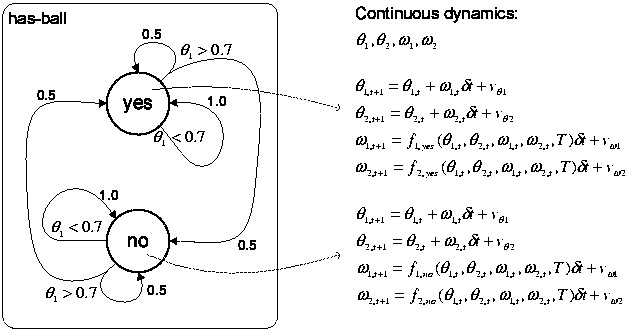 Active Estimation for Switching Linear Dynamic Systems. L. Blackmore, S. Rajamanoharan and B. C. Williams. In the proceedings of the Control and Decision Conference 2006. Finite Horizon Control Design for Optimal Discrimination between Several Models. L. Blackmore and B. C. Williams. In the proceedings of the Control and Decision Conference 2006. Best Paper in Session. Finite Horizon Control Design for Optimal Model Discrimination. L. Blackmore and B. C. Williams. In the proceedings of Control and Decision Conference 2005. Combining Stochastic and Greedy Search in Hybrid Estimation. L. Blackmore, S. Funiak and B. C. Williams. In the proceedings of the 20th National Conference on Artificial Intelligence (AAAI) 2005.